Frozen cooked meatballs cook in 12 minutes or less, making them a good choice for quick, weeknight meals. They are usually made from ground beef, seasonings and bread crumbs and have a mild flavor that even most kids appreciate. Since they are already cooked, they only need a brief reheating. Serve meatballs with spaghetti, in Italian sandwiches or as an appetizer. Preheat the oven to 350 degrees F. Place the meatballs on the baking sheet, spaced 1/2 inch apart. 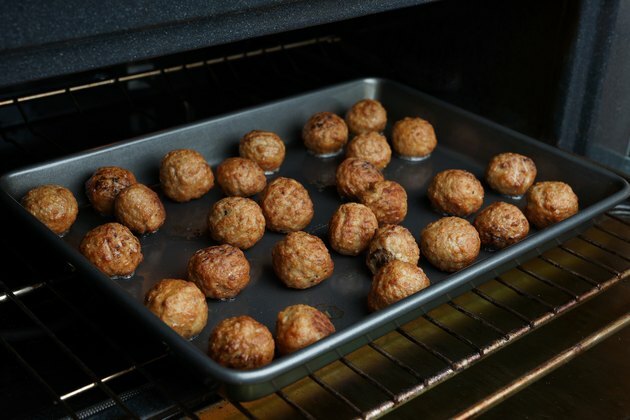 Heat the meatballs 10 to 12 minutes in a conventional oven, or eight to 10 minutes in a convection oven. 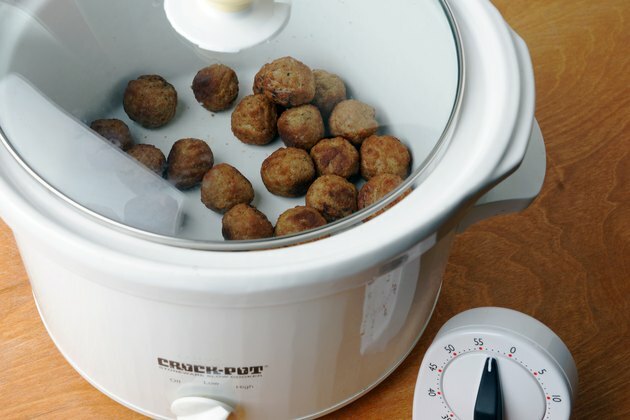 Place the meatballs in a slow cooker and replace the lid. Turn the cooker on high for one hour; turn the cooker to low and heat for two to three more hours, until heated through. Place the meatballs in a shallow, microwaveable dish, in a single layer. Place a paper towel or lid over the meatballs. Microwave them on high for four minutes. Stir the meatballs and heat them for an additional two minutes, or until they are heated through. Pour spaghetti sauce over the meatballs when cooking in a slow cooker before you leave for work. Cook the meatballs and sauce on low and dinner's ready when you get home. Frozen, cooked meatballs are pre-seasoned and need no salt or pepper. Ensure that the meatballs are thoroughly heated to avoid food-borne illness. Use a food thermometer and ensure the meat is cooked to at least 160 degrees. Return the package to the freezer immediately. Are Meatballs Good for You?